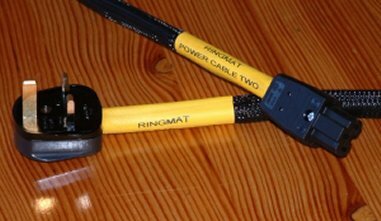 RINGMAT POWER CABLE TWO MAINS CABLE is a sizeable mains cable with a length of 4-core Power Cable and a substantial Earth cable at its heart. The Power Cable is the 4-core version of the substantial 5-core connecting mains cable used in the Pure Power Mains Cable. As in the case of the Pure Power Mains Cable, considerable care has been taken through extensive listening tests to ensure that the Power Cable TWO is of complimentary and comparable quality. Again, every care has been taken in the design of this Power Cable TWO Mains Cable to avoid those conditions whereby sound signals dependent upon mains power are adversely affected, such as where the wrong polarity has been used, the wrong number of strands have been used in conductors and through the use of solder to secure connections - only screws have been used to secure connections. Those familiar with the use of the Pure Power Cable as speaker cable will be recognise the practice. As with the Pure Power Mains Cable, we have effectively used a 5-core cable structure throughout for the Power Cable TWO version, with a single Earth conductor and two conductors each for live and neutral whereby ‘opposite’ conductors are paired. The Ringmat Pure Power Mains Cable has been specifically designed to complement our own unique range of Audiophile Cables and other products and this combination will reveal their musicality and all their other attributes to a far greater degree than is otherwise possible. The Pure Power Mains Cable is expensive to build because of the need to accommodate very sizeable conductor cores that will not terminate within conventional heavy-duty plugs. World-class quality of this type does not come cheaply. However, Ringmat Developments’ other Audiophile Cables and other Ringmat products, including the Statmat products, will not perform at their best when used in conjunction with any inferior mains cable. This is why we felt it was important to develop a high quality alternative Mains Cable - Power Cable TWO - at a more affordable price whilst still being in tune with our other products. As with the Ringmat Pure Power Mains Cable, the design of the Power Cable TWO enables an extraordinarily accurate sound reproduction to be provided in sound systems using it. Obviously, the quality and set up of the sound reproduction system itself is a crucial factor, but with the Ringmat Power Cable TWO Mains Cable there is the capability of outstanding tonal performance, imagery and transparency. The sound when using the Power Cable TWO is distinctly different from that when using the Pure Power Mains Cable. The smaller cores used with Power Cable TWO mean that the awesome sense of power and space available from the Pure Power Cable is not present to the same extent; it is narrower in bandwidth, smaller in scale and in soundstage, and the sound has less presence and resolution, but Power Cable TWO is still head and shoulders above most other so-called reference mains cables. In particular, the sound is noticeably more musical than with other mains cables. Plugs and Connectors: The design of the plugs used with the Power Cable TWO Mains Cable is very important and the ones chosen are the same as those used for the Pure Power Mains Cable. Cable Terminations: At the power socket end, the Mains cables are available with UK 13Amp, Schuko or IEC plugs, or with bare ends to meet local requirements with regard to mains plugs. At the equipment end, standard termination is with IEC plugs. They can also be supplied with bare ends. The standard IEC plugs are ‘hot’ versions rated at 16Amps. Heavy-duty rectangular C19 IEC plugs with the pins horizontal instead of the standard vertical are also available at 16Amps. The standard length of the Ringmat Pure Power mains Cable is 1.2metres. Lengths of 1.5 and 2 metres are also available, as are other lengths to order.